Over the last 23 years Kaifeng has been host to virtually every sort of celebration imaginable. Birthdays, anniversaries, sheva brochot, engagements, pidyan ha ben, exam results, new jobs, leaving do's, business successes - we have even had a chuppah or two here! It is surely a great compliment when someone chooses to use Kaifeng for their celebration. We feel it our responsibility to ensure the event is memorable and make it personal to you. We have been involved in raising many, many thousands of pounds for charity committees and other organisations. 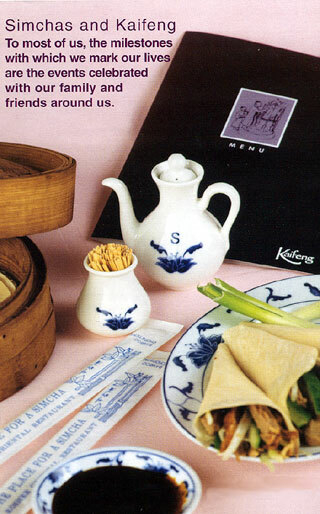 Talk to us and see how we can arrange a Kaifeng evening for you at the venue of your choice or in the restaurant. You can have a party of 4 to 100 people in the restaurant, which is fully air-conditioned and has an integral wireless PA system. The whole restaurant can be booked for your exclusive use. We deliver hot, fresh Kaifeng food to your venue course by course to ensure the food is in the perfect condition for your guests. We can supply serving platters, chopsticks, printed menus and even beautiful china soy sauce pots and toothpick holders for each table. …and we will take time to plan the menu to reflect exactly what you would like your guests to enjoy. We can arrange "all inclusive" deals that will include all the food and drink so you will know the exact cost before the day. We even print special menus for each event so that you have a souvenir for your scrapbook. - And together we will organise your perfect simcha.